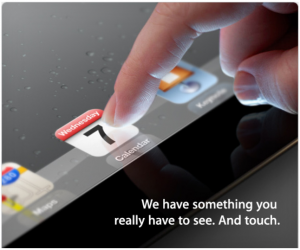 Today, Feburary 28th 2012, Apple began sending invitations to a press conference which will be held on March 7th 2012. This event will take place in San Francisco, California at the Yerba Buena Center for the Arts. According to Mashable the invitation reads “We have something you really have to see. And touch”. On the invitaton is an image of the bottom of an iPad’s glass bezel. The interesting thing about this image is the fact that the iPad in the image is missing a home button. This leads us to believe that the next iPad will be dropping the home button for a touch sensitive glass bezel. This may be why Apple put “and touch” at the end of the invitation. We also believe that the iPad 3 will have double the pixel density of the iPad 2. This is most likely why Apple put “We have something you really have to see” in the press invitation. Make sure to check back to Tapscape for more breaking news on the iPad 3.